Most traditional CBR systems are passive in nature, adopting an advisor role in which a user manually consults the system. In this paper, we propose a system architecture and algorithm for transforming a passive interactive CBR system into an active, autonomous CBR system. Our approach is based on the idea that cases in a CBR system can be used to model hypotheses in a situation assessment application, where case attributes can be considered as questions or information tasks to be performed on multiple information sources. Under this model, we can use the CBR system to continually generate tasks that are planned for and executed based on information sources such as databases, the Internet or the user herself. The advantage of the system is that the majority of trivial or repeated questions to information sources can be done autonomously through information gathering techniques, and human users are only asked a small number of necessary questions by the system. We demonstrate the application of our approach to an equipment diagnosis domain. We show that the system integrates CBR retrieval with hierarchical query planning, optimization and execution. S. Li and Q. Yang. 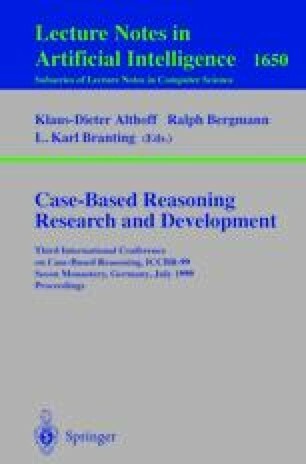 ActiveCBR: Integrating case-based reasoning and active databases. Technical Report TR 1999-03, School of Computing Science, Simon Fraser University, Burnaby BC Canada, January 1999. http://www.cs.sfu.ca/qyang/Papers/activecbr.ps.gz.